ExecutedToday.com » 1659: William Lamport, the real Zorro? 1659: William Lamport, the real Zorro? William Lamport was born in Wexford, by blood the descendant of English aristocracy and by conviction kin to Ireland’s Gaelic resistance to English incursion. His grandfather Patrick fought for Irish rebels at the Battle of Kinsale. This was years before Lamport’s own birth but the youth must have been a chip off the old block: by the 1620s, as a student, William got himself run out of London for his aggressive Catholic proselytizing. Or at least, this is what William would say of himself: for his early years, we have mostly just his own word to go by. 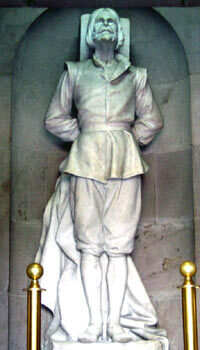 Lamport took exile in Spain and there found his niche as a soldier and ladies’ man under a Hispanicized name: “Guillen Lombardo de Guzman” — that last nombre taken in tribute to his patron, the Count of Olivares. 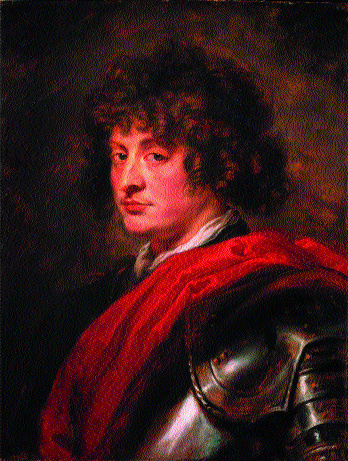 Guillen Lombardo de Guzman was a considerable enough figure in the Spanish court to have his portrait painted by Rubens. These were formative years for the young man, but the crucial formative events we can only guess at: how did his thought evolve to the seditious or heretical form that set him against the Inquisition? Why did he cross the Atlantic to New Spain with the Marques of Villena in his late twenties? This undergraduate thesis (pdf) tries to unravel the mystery of the man. What we know is that he was denounced to the Inquisition in October 1642 after attempting to enlist a friend in a subversive plot. The records here come via the Inquisition and are colored accordingly, but they indicate that Don Guillen aspired to cleave off New Spain with himself as the king of a radically egalitarian new state that would abolish all race and caste divisions. Among the papers he prepared for this visionary future was the first known declaration of independence in the Indies. He spent the next 17 years in dungeons — less a few days when he escaped prison on the morrow of Christmas in 1650 and quixotically proceeded to nail up revolutionary manifestos on the cathedral door and around town denouncing the Inquisition. He was quickly recaptured, having now assumed the character of a determined rebel against powers both spiritual and temporal and consigned to an auto de fe in Mexico City’s main square. He was supposed to burn alive, but is said to have effected a cleverly merciful self-strangulation on the iron collar that staked him to his pyre. It has been postulated that Johnston McCulley borrowed from a 19th century historical romance starring Lamport and his underground circle in McCulley’s The Curse of Capistrano — the serialized novel that introduced the dashing Mexican nobleman with a double life as champion of the little guy, Zorro. Lamport’s native Wexford — the one in Ireland — has consequently celebrated him in a “Wexford Zorrofest”.